Finding out you are pregnant is supposed to be a time of joy. For those who are not ready to start a family, this time can be full of anxiety and uncertainty. Women of all ages can go through a wide range of emotions upon learning of their pregnancy, and no one reaction is the right one. Learning that you are pregnant necessitates a tough choice — what to do with your baby. If you are unsure as to how you should proceed, A is 4 Adoption is here to highlight the benefits and advantages that our adoption center can provide. Unlike any adoption agency in California, our private adoption services serve to deliver quality birth mother help, from scheduling doctor’s appointments to transit, groceries, and more. We understand that an unplanned pregnancy can be scary, and our welcoming staff will work with you ensure that both you and the child receive the benefits you are due for your courageous actions. Dealing with an unwanted pregnancy can result in numerous birth mother expenses, expectations, and more. While your situation may seem bad, it’s important to know that you are not alone. Today, we’ll highlight a few of the reasons why birth mothers have decided to put their child up for adoption. Remember that our adoption center is here to help you every step of the way! This viewpoint is very common for teen pregnancies, but it can also apply to women of all ages. In fact, not being ready for parenthood is one of the top reasons why people reach out to us for quality adoption services. If you are not ready to provide the best life possible for your little one, adoption can be an amazing choice to ensure that your infant is placed into the care of adults who are prepared and excited for the opportunity. If you do not have a dedicated partner in your life, it can be even more daunting to take on parenting alone. Many single mothers face a lot of strain when it comes to welcoming a newborn, from financial problems to care needs to support systems and more. Unless you are single and ready to face the challenge alone, domestic adoption may be a beneficial choice! I can’t afford to have a baby. Financial limitations are a big factor for any decision, and when it comes to having a baby, you may realize that you are not ready financially. Medical costs, from the first ultrasound to the last day at the hospital and beyond, are higher than ever. Pregnant mothers who are struggling to make ends meet may decide to put their child up for adoption to ensure that their little one receives everything needed for a quality life. You may want to raise your baby, but realize that you won’t be able to afford the things you want to provide to him or her. I have other goals and priorities to focus on. Many adults decide to go to school, travel, and establish a solid career before having a child. If you are pregnant and are not ready because you have major tasks to focus on (school, career, etc. ), adoption may sound like an ideal choice. The adoptive parents you choose will be ready for the task, and their love for your child will enable you to focus on enhancing your life before experiencing the joys of parenthood. Priorities can also expand to include elements that may complicate raising a child. Dealing with a recent medical diagnosis, for example, may make having a child more challenging while you focus on rehabilitating your health. No matter your reason, A is 4 Adoption is here to help! I believe adoption will be the best choice for my child. Some pregnant women will struggle with deciding what is best for their unborn child. The choice is ultimately theirs on what to do, and any decision made will have long-lasting results. With this in mind, birth mothers may decide that open adoption is the best choice for their child. This decision should be seen as a selfless declaration of love, as putting your trust into others to raise your own offspring is a major undertaking. Regardless of the logic behind this decision, adoption can prove to be an amazing choice that gives your infant the best opportunities to succeed within a loving and established family. 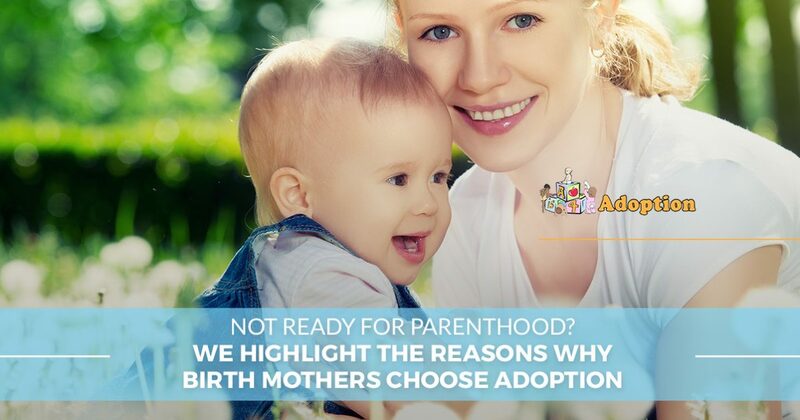 The reasons why birth mothers choose adoption are as varied as each individual. If you have recently found out that you are pregnant and are unsure as to what you should do next, our adoption center is here to help. A is 4 Adoption is not an adoption agency in California; our private adoption practice takes on small client loads to find the absolute best fit for each family. If you would like to learn more about how to put your child up for adoption, or you want to learn more information on our comprehensive birth more support, be sure to contact us today!